the 14th century battle at Teba "for the Crucified"
The medieval �Castle of the Stars� is at Teba, Spain and was the objective of a battle between Christian leaders and the Saracens who held the fortress. James Douglas took the heart of Robert the Brus into battle as a Spiritual measure to heal the soul of the king. The first surge was led by the Douglas knight and it was a ruse to leave him defenseless. Five mortal wounds in his chest sent the Scottish hero to his death. As the author Sir Arthur Conan Doyle, James Douglas chose the armorial bearings of five red roses in a similar array for the tabard of his 14th century hero of �White Company�. The stone monument in commemoration of the battle in Teba, 15th August 1330 was brought to the medieval hamlet by Lord Selkirk and Lt. Col. Gavin Douglas. Conducting research in Spain was exciting. As I wrote the scenes from the battle of 1330 I was able to see and hear the �tourneying� as they called it in the 14th century. James Douglas also told me that he was led there to die. He explained that the mother of Edward III plotted �de mischief� against him. She had suggested at their meeting over the betrothal of her daughter to the young king, David Brus, that the Douglas support their cousin, Alfonso of Castile, the King of Leon and Castile in his fight against the Muslims in Spain. In the summer of 1330 a messenger came to Douglasdale, stopping at Park Castle with two letters bearing the seal of King Edward of England. The first document was a seven year letter of protection for Sir James Douglas to pass through England unprovoked. The second was a letter to his cousin Alfonso XI asking the king to offer James an opportunity to join him in the fight against the Saracens, for �his heart burns for the Crucified, that he must go on Crusade�. James presented many insights to that time he spent in Teba. And my visit to that location verified his descriptions as well as details such as the climate and differences in daylight compared to Scottish conditions in battles. Seeing the actual battle site was incredibly moving. And finding his references as Sir Arthur Conan Doyle to that lifetime, particularly with his last stand at Teba, in more contemporary writings was nothing short of amazing. 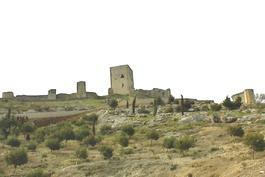 The late Gavin Douglas provided this photograph of the battle site at Teba, Spain. Being there was an emotional time where Spirit communicated to me in a clairsentient manner. Finding the medieval village was an incredible journey. The maps in Spain were unclear as the route numbers varied from the road signs. Then Spirit took over and guided me turn by turn to a roundabout that had a sign post: TEBA and an arrow pointing the way. The long, dark nights and the curious landscapes intrigued the Douglas knight. In medieval warfare in Scotland, James used the twilight that lasted long after midnight to gain the upper hand in battle strategy against a better armed and larger force of the English army. In Spain the nights were clear and the stars blanketed the sky. It was a strange moment, laying under the darkness, in the shadow of the Castle of the Stars.